Gidget joined the BSC family in the summer of 2015 and she has been a wonderful addition. Gidget has a spunky and playful personality, with near unlimited sweetness (living up to her registered name of Sweet Tea). 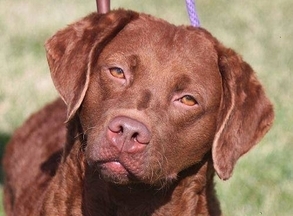 She is a beautiful, rich sedge colored girl with excellent temperament. She is an adoring mother to our girls Derby, Sadie, and Mystic. Now retired from breeding, Gidget has been re-homed with a wonderful family where she is getting to thoroughly enjoy her retirement. Please visit our Breeding Plans page or contact us for more information on our upcoming breeding plans.